Once every decade, the German city of Münster hosts a sculpture exhibit in its public spaces. The first exhibit was in 1977 and so in 2017 it’s time again for the experimental program in this Westphalian village. Münster is a thriving regional capital with a large university, thousands of bicycles, and town and regional leaders of great vision who have a desire to support art. It is hard to imagine an American city of Münster’s profile hosting an adventurous project—even if it would bring tourists to its hotels and restaurants. The curator of the exhibition, Kasper König, choose not to have a theme for the event: it’s better, he believes, to allow artists total authorship of their work and for them to exist in their own site-specific context. 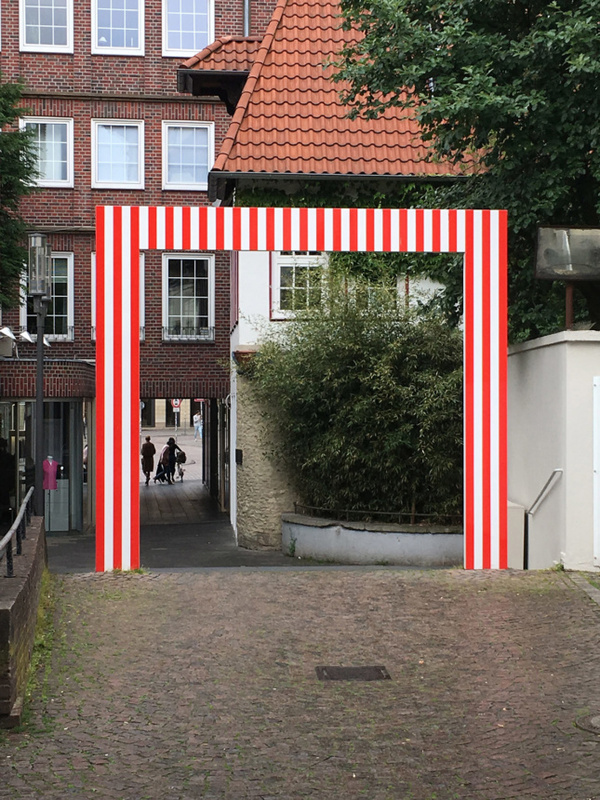 Participating artists are invited to Münster in advance to investigate the city before they propose a project. It allows the work to be site-specific while also enabling it to point “beyond its boundaries,” as the Project’s catalogue says. Münster purchases several of the sculptures from each edition of the event so they remain permanently in place and there are several of these works visitors should not miss: a bus stop by Dennis Adams, Siah Armajani’s study garden, Dan Graham’s Octagon for Münster, Daniel Buren’s red stripe gate in a narrow alleyway, and Rachel Whiteread’s balcony of books in the LWL-Museum of Art and Culture. This strategy of purchasing works by the world’s best sculptors is such a smart way of bringing the world of forms and ideas into this provincial town and our city planners could learn a great deal about the role of culture in the city. In any event, here is my list of 2017 installed projects not to miss if you are lucky enough to be in Westphalia in the next three months. 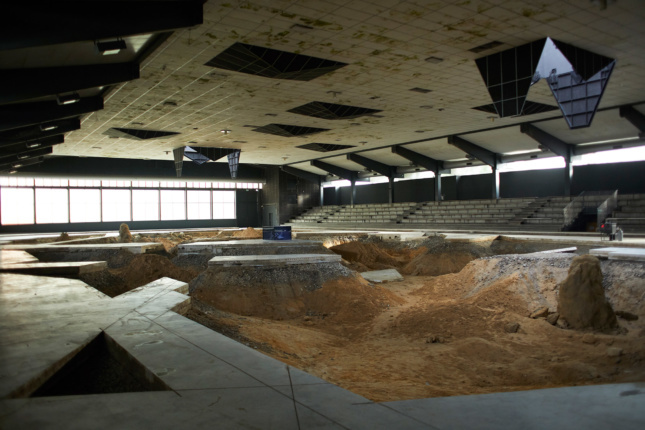 The most spectacular work in Münster this year is Pierre Huyghe’s After A life Ahead, an excavation of a large, shuttered ice rink on the city’s periphery. Huyghe ripped the concrete floor with saws and then piled the newly freed slabs around the site like ancient shards. He then excavated into the earth below the old floor and created a hilly, damp landscape accessible by visitors. In the middle of this landscape on a sand hill is a glass incubator that contains a HeLa cancer cell line, the growth of which triggers “the emergence of augment reality shapes,” according to the Münster Sculpture Project catalogue. These shapes are mirrored in the triangular forms of the slabs and window openings in the ceiling; this creates a sculpted landscape experience that Hugyhe calls “a time based bio-technical system.” Before I nervously focused on mold growing on the ceiling panels, the immersive experience of the installation was one of the most powerful interior spaces of recent memory. In the Westfälischer Kunstverein is the installation Surplus of Myself by American artist and architect Tom Burr; this piece investigates Paul Rudolph’s Yale Art and Architecture building as if it were a suit of clothes. Burr, who thinks all architecture is “a matter of participation of the human being,” asks us to “consider a room impersonating a body, an inverted volume with naked walls quivering in plain view of the town.” He concludes there are “moral codes: that are applicable to rooms” and, like few others, he able to take on this formidable building and its architect, whose image is included in the exhibit. He describes this tough architecture school interior as one with “swagger and sway” that asks to be “touched; asked to admired, but never fondled.” Is there a better description of this important building anywhere? 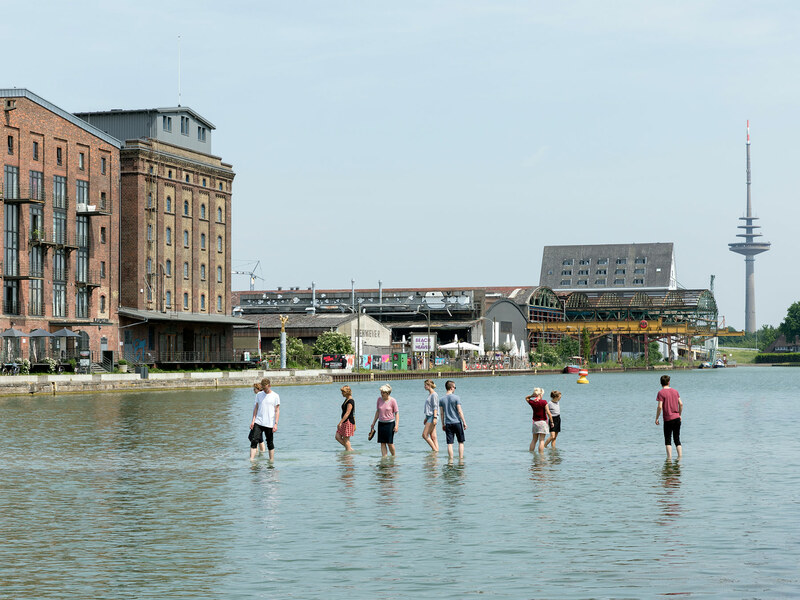 The best participatory installation in Münster is Ayşe Erkmen’s On Water. 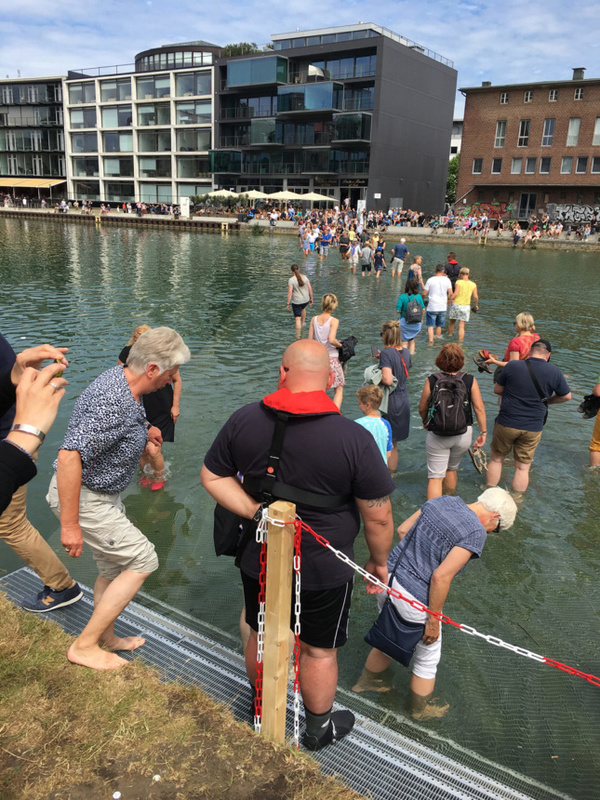 She submerged a metal mesh bridge just below the level of a Danube Ems canal so that participants and viewers get the sensation of walking on water. They are able to traverse the narrow body of water from an area that has been totally gentrified with fancy flats to the other side of the canal that is still an industrial oasis and primed for gentrification. It’s like walking across time as well as space from the present to the deindustrialized past and people seem to love it, though it’s not the cleanest body of water. 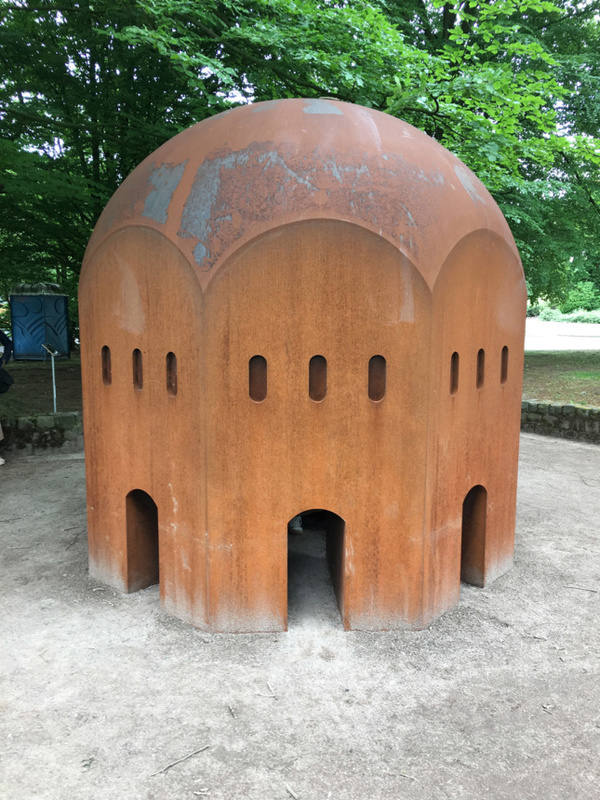 The most powerful pure sculpture/architecture project in Münster is Thomas Schutte’s Nuclear Temple, which is cast of Cor-ten steel. It has beautiful but odd proportions (like a large pencil eraser) and it’s beautiful and horrifying at the same moment. It draws us in but is too small to actually enter and thus becomes a self-contained monument that questions the role of architecture in today’s world. Is architecture today meant for only gazing or branding and not use? 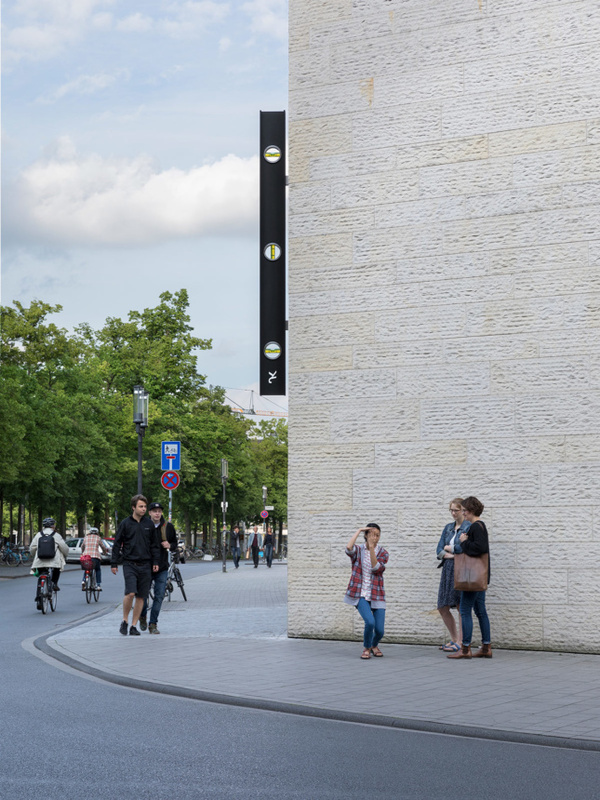 No architect in Münster will miss artist John Knight’s beautifully machined and playful large metal water level attached to the side of the LWL-Museum of Art and Culture like a sign, branded with Knight’s initials, which brings the role of design and construction into the public sphere. It takes this beautiful object of construction and reminds us of architecture’s significance for culture and the ambitions of the city. Let’s hope it remains on the museum facade long after the 2017 sculpture project comes to an end later this year. Lastly, Jeremy Deller’s Speak to the Earth and It Will Tell Yyou started in 2007 and won’t leave the city. The artist is fascinated by popular, working class and bottom-up culture. 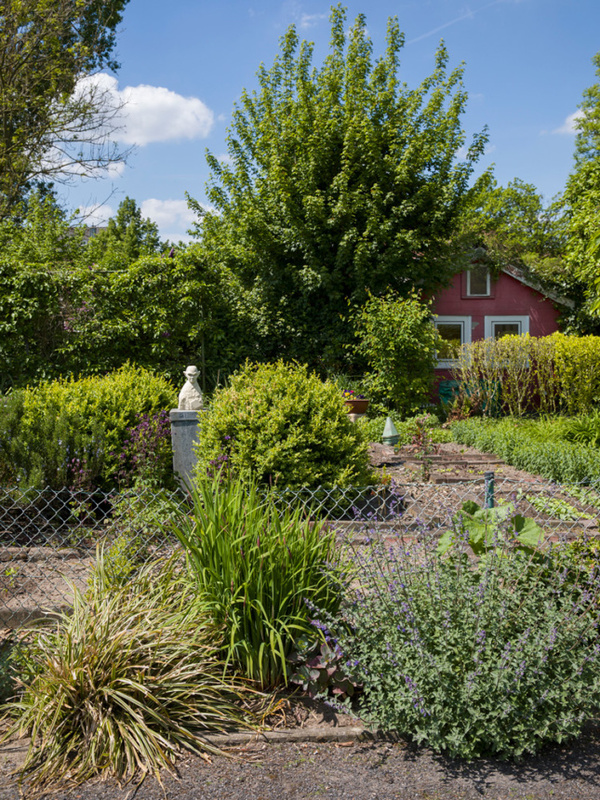 The artwork started out in local allotment gardens in 2007 and asked the gardeners to keep a daily diary’s of their gardening efforts as a way of marking changes due to climate change and as a record of how local residents work in these spaces. 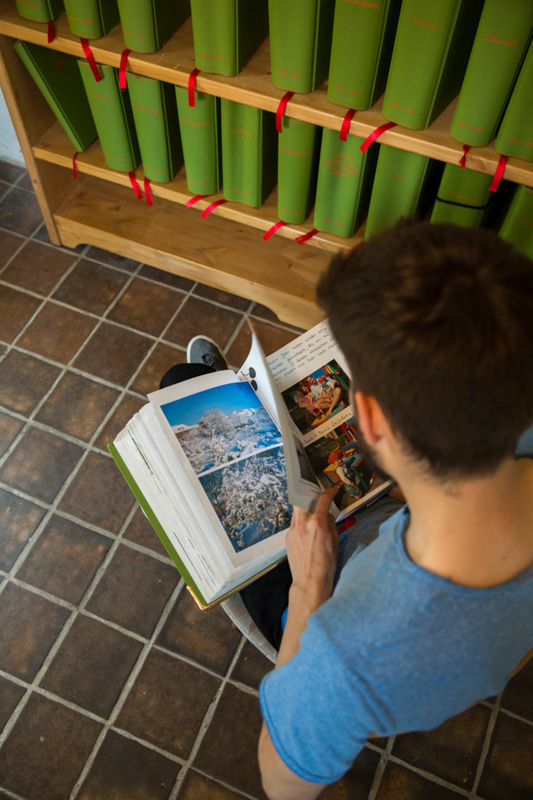 They are a record of daily life and a plea for more environmental awareness. There are some who argue that international surveys like Münster no longer matter as powerful statements since curators have become the true stars, selecting work out of public view and then setting their own limits and themes over the combined display. Of course, at this exhibition, there is no theme, but the curators are still making choices and writing catalogue essays in a traditional survey format. But to have a chance to see Huyghe, Deller, Buren, Whiteread, etc., take on Münster and the world is still worth the time devoted to a special trip. In all, there are thirty-five sculptures and installations spread over Münster that are easily accessed by the rent-a-bikes parked all over the city so go and make your own decision. The Münster Sculpture Project runs through October 1, 2017. See its website for more details.